Passionate. That's what I'd say if I had to describe Sébastien Boudet with one word. (Good thing I don't have to - or it'd be a pretty short blog post.) He's burning with passion for his craft. He's not afraid to call out those in the business who do cheat, and he refuses to do so himself. And in his opinion, there are many ways to cheat, and many people do. 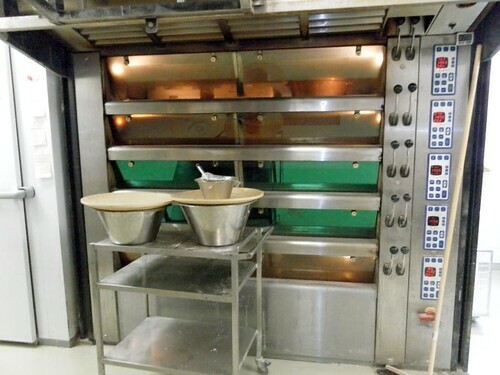 It's not many who truly take pride in their baking anymore, but he wants to change that. And, after spending two days with this extremely charismatic and charming Frenchman, I believe he can make a big difference. He bakes, with completely natural flour, water and salt. And time. And passion. A lot of both. His flour is free from additives, it's stone-ground just the way he likes it, and he's even bought a few fields to grow exactly what he wants. (That's taking things a bit far, perhaps.) He never uses yeast in his sourdough, and he always lets the bread proof for at least 12 hours. 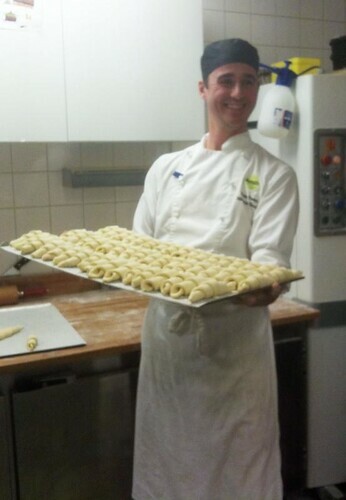 He's a classically trained French pastry chef, and ended up in Sweden out of love. He met his wife, who is Swedish, and then moved here ten years ago. 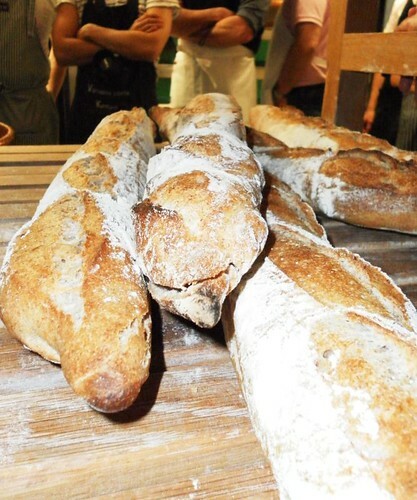 Three years ago, he opened Petite France, which is his bakery and café. 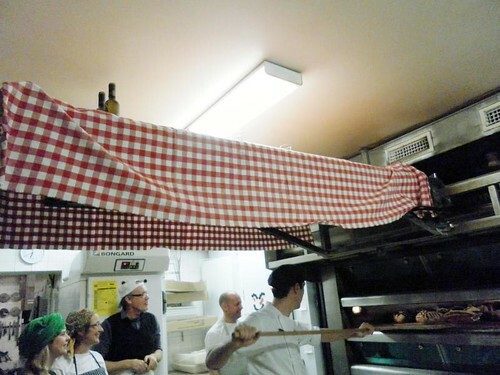 He wanted to set the standard for excellent bread and pastry, to give everyone a point of reference. To know, this is good. 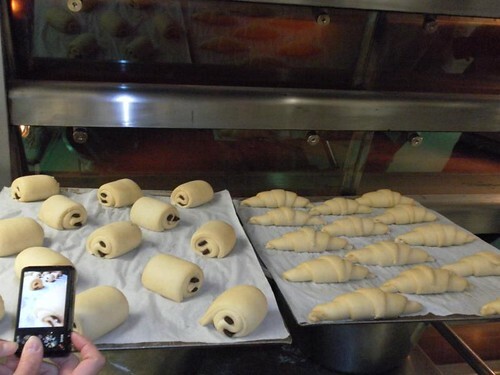 His croissants, his loaves of bread, his macarons. All perfect. 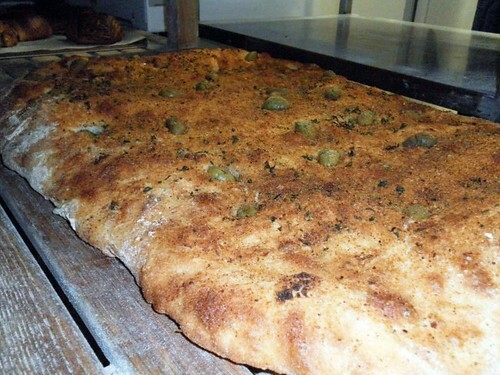 Flat bread baked from poolish, with garlic and olives. Extremely tasty! I was really happy I decided to take a class with him - he offers them to home bakers from time to time, and they book very quickly. 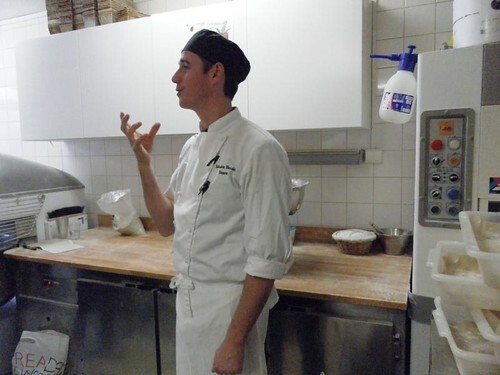 He also does classes for pro bakers, and he really wants to teach future bakers as well, as many of them don't learn proper baking anymore but are expected to bake from ready-made mixes. I spent a day and a half with him and ten other eager students, and we soaked up all kinds of useful information. 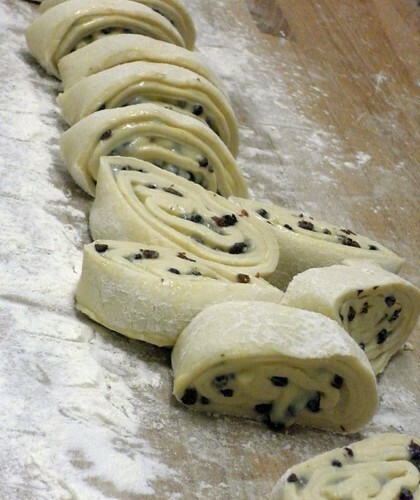 Pain raisin - a croissant dough with vanilla cream and raisins. Scoring the bread just before baking - very important. Sébastien uses a lamé which is basically a really sharp razor. 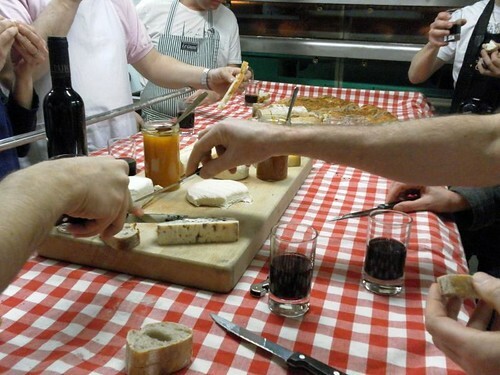 We had dinner - cheese, bread and wine - on top of the conveyor used to put the breads in the oven. See? Sébastien blogs, too - as a way to record his work, and also as a way to share his passion. 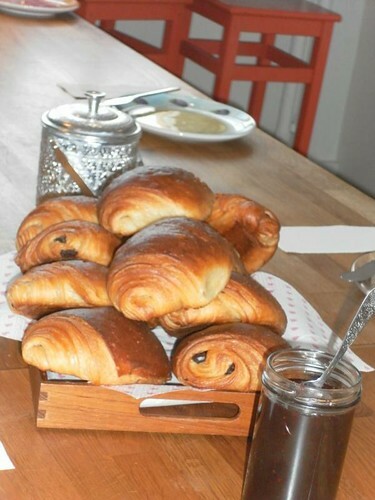 The blog is called, aptly enough, Brödpassion (which I'm sure you can all translate easily - Bread Passion!) and it's a great read. It's where he announces his new courses, shares technique movies (that he often records as he's alone in his bakery in the middle of the night - check out this one about making Choquettes, for example!) and shares some recipes. 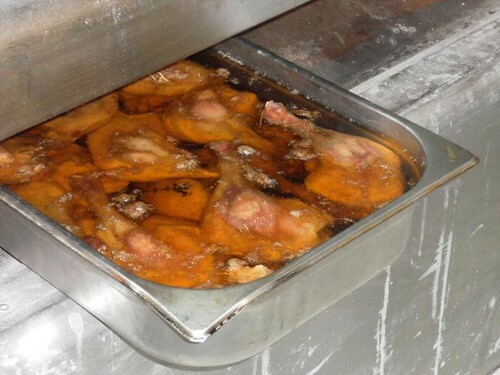 Duck confit, simmering away for four days at the bottom of the oven. If you're in Stockholm, do visit Petite France. It's a great place for breakfast, lunch or an afternoon treat. (Hurry though - it's for sale.) And if you see a café offering macarons from Macarong, those are the ones made by Sébastien and his brother Damien, and I think they rival those of Pierre Hermé and by far outclass Ladurées. And most of all, if you have the chance to learn from Sébastien: do so. I'm sure the world will be seeing a lot more of him in the future. This is one bright star. Looks fantastic. Definitly also want to take course there. this all looks fantastic - I'm envious! Thanks for sharing! His blog is great and I love his videos! Your blog is great, too! Brilliant! Please keep us posted on your efforts, and on whether he opens a new place after selling Petite France. Thanks for sharing your experiences, Anne! 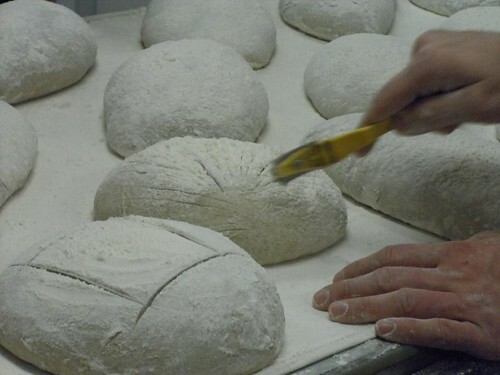 I especially like the idea of baking bread with the different flours and so on, but keeping the overall weight the same - and I agree that is very empowering! 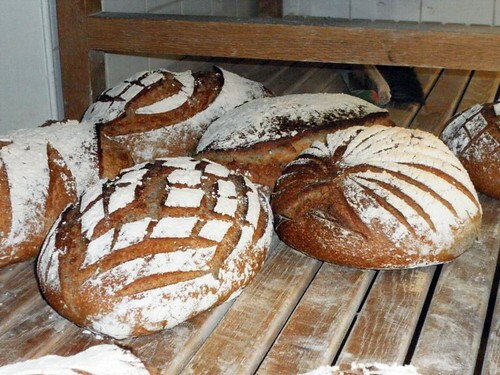 You can make up your own bread based upon what you like! Keep us posted on what you try at home!